So, I have some really exciting news! I’ve partnered with Vestiaire Collective, a website where you can buy and sell luxury pre-owned fashion, featuring brands like Saint Laurent, Celine, Chanel and Givenchy, to sell a few items from my closet! I’ve already added 3 designer bags ( Saint Laurent, Alexander McQueen & Proenza Schouler ) to my seller’s account, so CLICK HERE to check them out! Today’s look is really a combination of all my favorite designers at the moment. Love these Saint Laurent booties! Aside from being obsessed with ankle boots in general, I really can’t resist a really good studded option ( the most amazing version from Laurence Dacede here and Isabel Marant here ). For this look, I pared them with a beautiful REDValentino dress ( also dying over this Givenchy version ) to create a rather stark hard & soft contrast. Sure, I could have worn the dress with a pair of really cute strappy sandals, but I think the boots add a nice edgy touch and make this outfit a bit more day-time appropriate. To complete the look, I added a studded Saint Laurent bag ( really cute studded Sonia Rykiel option here ) because A: can you really ever have enough studded pieces in your outfit? and B: because I do love to pair fringe and tulle! Love the dress! You look very pretty! Have a great day! Great news! Love your dress, it is so amazing! That dress is gorgeous and gothic, I love it! 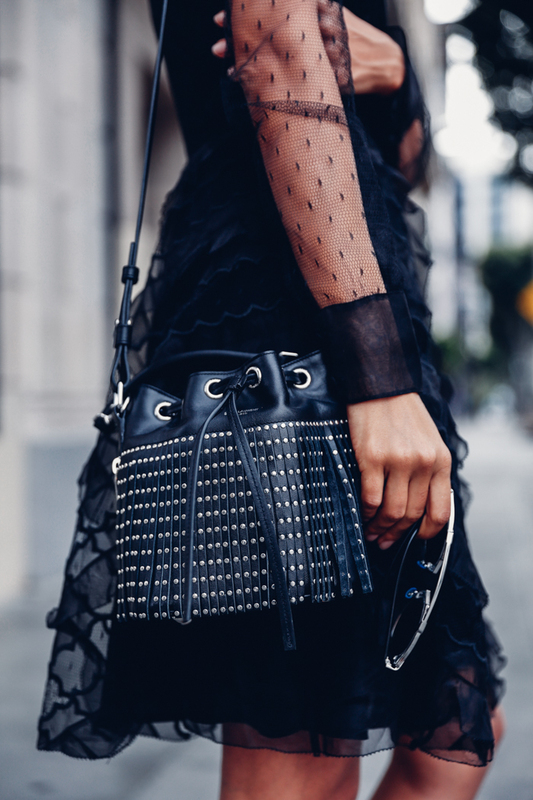 Paired with the studded bucket bag, it looks amazing. Just a stunning outfit! The shoes are gorgeous! The dress is stunning and I love all the details of it. You are goals! You're too gorgeous! I just adore polka dots on lace. Love this gothic chic look – the booties are amazing! Incredible outfit!! You look breathtaking!!! The bag and shoes are major pieces. loving your all black outfit! In two weeks of following your blog I have totally fell in love with your style! I'm in love with everything about this look! Gorgeous dress, love the lace details. You look totally amazing! Black is the color you want to go with if you want to look extra special, it's just facts. Research says that people that wear black a lot tend to look better. No idea why, it just is. You look totally amazing! I'm in love with your boots<3! Gorgeous! Love the dress and the accessories are fab! WOW. Photos are amazing <3 Especially the first one. Check out my latest post about autumn winter fashion trends ! NEW BLOG POST!! Today we talk about DECOR: GALLERY WALL INSPIRATION!! Evereything you need to know to make your own gallery at home and transform your house in a chic and elegant space! You rock in this look!!! Stylish, beautiful total black look. This dress is to die for! What kind of filter you use for your pictures? High quality article and I love not just this one, but all her outfits. I simply can't tell which is better. Annabelle's style is incredible! Hii This is Post is So Think-full to Me, Because it is Attracted Me. You look great in this outfit!